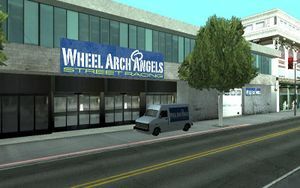 Wheel Arch Angels is an automobile customization shop in Grand Theft Auto: San Andreas that specializes in tuners. It has one location, in the Ocean Flats district of San Fierro. The shop is available after completing "Zeroing In" in the Wang Cars asset mission strand in San Fierro. All available modifications at Wheel Arch Angels center around street racing: the front and rear bumpers, roof, exhausts, spoilers, and side skirts are all replaced. These parts have two fictional names: Alien and X-Flow. Available paint jobs depend on the tuner being modified, and are reminiscent of street racing decals. 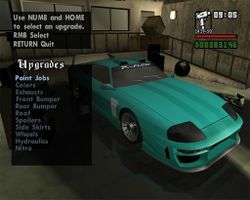 However, (done on the PC version) when heavily modded cars from this garage are stored in a player's garage, the custom paint job may disappear completely, and when a player tries to repaint the car with the same paint scheme, the game claims that the color scheme is already on the vehicle. The interior of Wheel Arch Angels with available modifications and a modified Jester. This page was last modified on 15 April 2015, at 01:57.